If there was a protien my husband could eat every day for every meal, it would probably be shrimp. I generally buy double just for him. 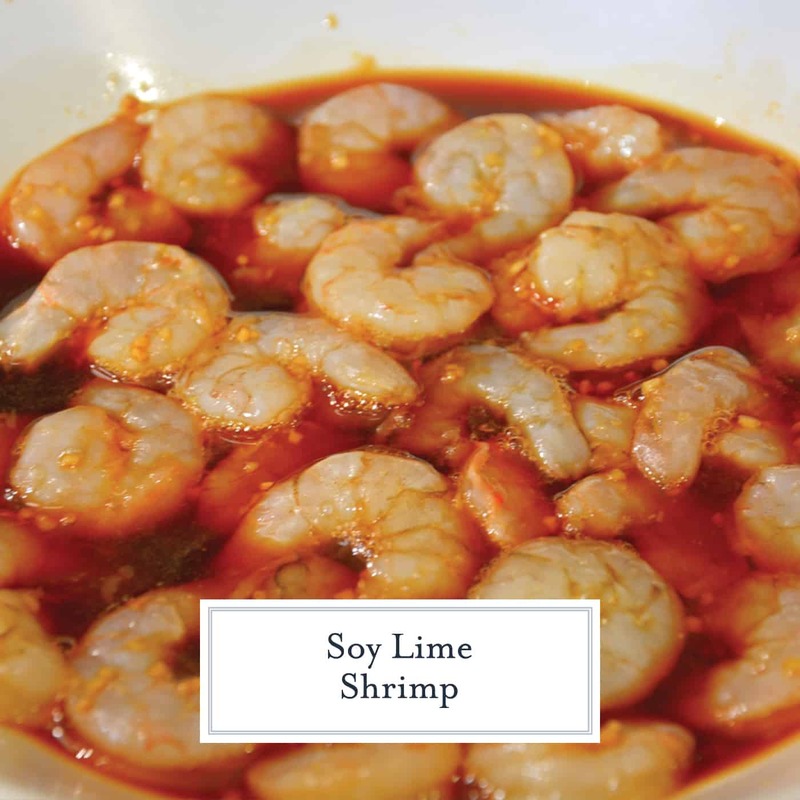 Soy Lime Shrimp is an easy shrimp marinade perfect for eating on their own, in a salad or as a side. 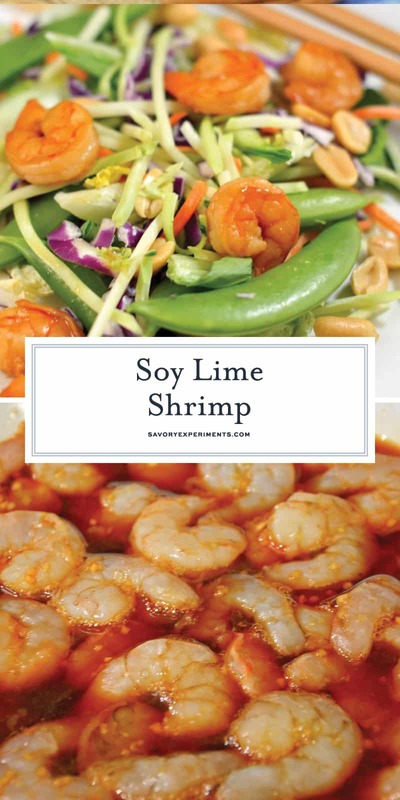 Soy Lime Shrimp is an easy shrimp recipe with loads of a flavor and only 5 ingredients. 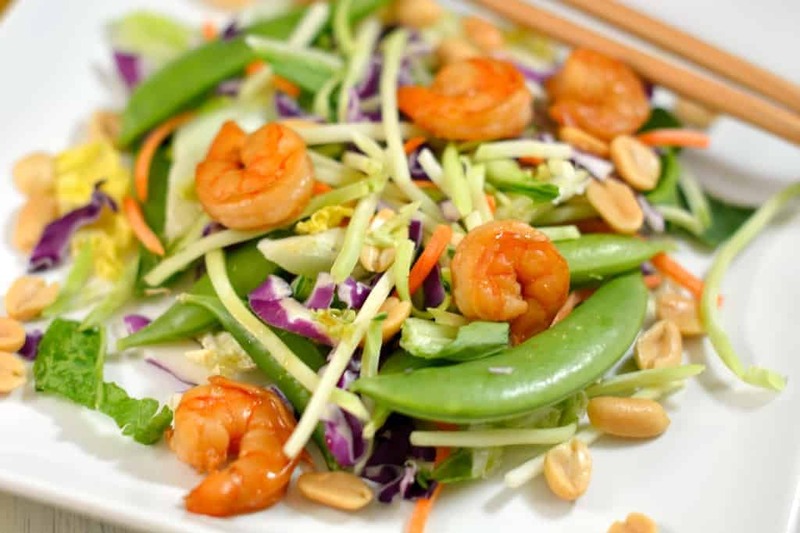 Grill or saute your shrimp and serve on a salad, as a side or eat on their own! We are all busy. I’m sure I’m not the only one who feels like I don’t have time to breath starting from the week before Thanksgiving until after New Year’s Day. Then January comes around and I am working on my New Year’s Resolution, which will undoubtedly be to “make healthier choices,” followed by spring, summer and fall which will come with their own challenges and goals around time management and making healthy choices. 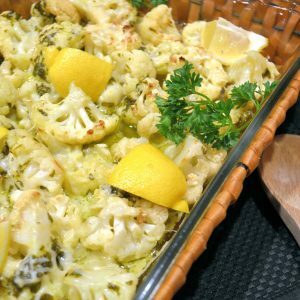 I am always on the lookout for healthy recipes that have loads of flavor. Soy Lime Shrimp is one of those. The first thing to know is that soy sauces are not created equal. For dipping sushi or as a flavorful condiment, a dark soy sauce is best. I even like mushroom flavored. But for marinades like this, I prefer a low sodium soy sauce. Still lots of robust overtones, but not so overpowering that you can taste the other flavors like lime. Shrimp are great for a quick meal. They marinate quickly, soaking up delicious flavor. And they cook fast. 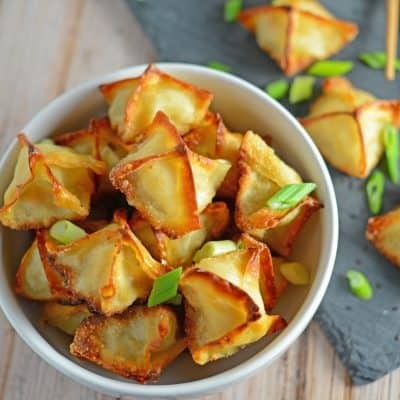 Whether you plan to use them to top your salad, serve as a side dish with your favorite Japanese dish or pop them on your own as a snack or appetizer. If you like easy shrimp recipes, check these out! Mix all ingredients in a medium bowl. 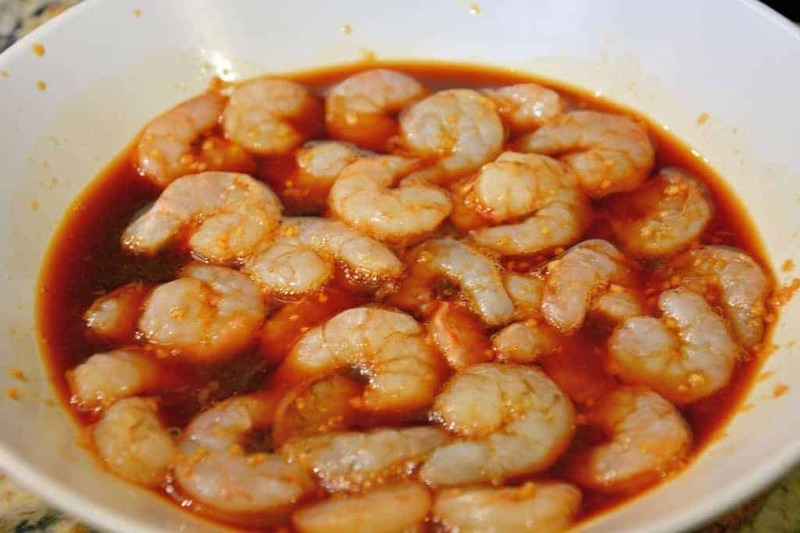 Allow to sit for 10-15 minutes, stirring at least once to fully coat shrimp. Heat medium skillet over medium-high heat and lightly coat with cooking spray. Add shrimp, discarding marinade. Cook on each side for 2-3 minutes, or until pink and curled. Exact cooking time will depend on the size of your shrimp. 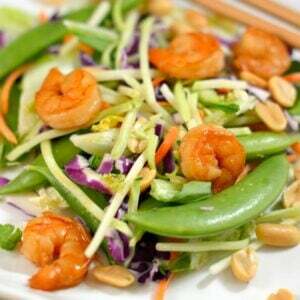 Remove shrimp and top them on a salad, serve them as a side dish or eat them as-is! Everyone’s going to want to get into this Ginger Bok Choy Soy Shrimp action after the eating frenzy that’s been going on! 🙂 Pinned and YUMd. Oh wow I am a huge fan of bok choy and shrimp. I want to try! I love the idea of salad right after Christmas. Help balance out all those sweets. This looks amazing! This looks great! Can’t wait to try it after the holidays. 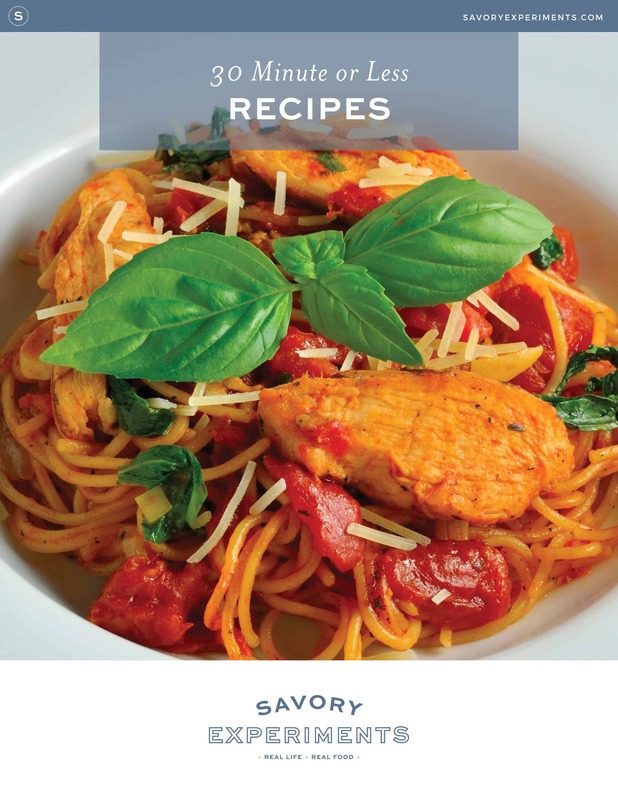 Every bit of this sounds great…awesome recipe! Shrimp and salad makes me smile! Love these salad kits as they are soooo convenient! Looks like a scrumptious meal ready to be prepared. This looks amazing, Jessica! I love shrimp!! This salad looks fantastic and so simple! I love ginger and can’t wait to give this a try. Yum yum. I need to try these salads! They are right up my alley! We have stir-fry often- I love the twist of a stir-fry salad! Shrimp is my favorite! this looks amazing. Thanks for the giveaway! Yum-my! This salad looks delicious! Yum!! I could use some healthy food this holiday. Oh yeah, I entered that one. I’ve go a house full of stir fry lovers! This looks like a delicious meal! My husband loves shrimp so he would love it! You make all food look so delicious. I would be happy to be your neighbor so I could taste test everything. 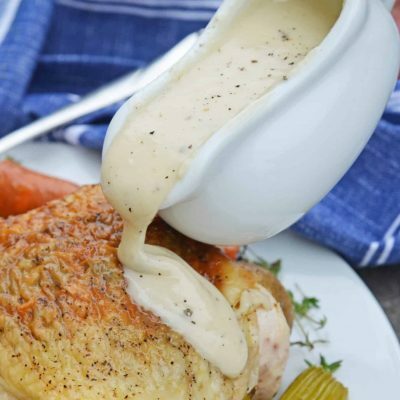 Looks like a delicious recipe! Yum! That looks delicious! I love it’s gluten free, so I can enjoy! Im sold! You had me at soy lime shrimp and its instantly pinned! Soy Lime Shrimp. Oooo That looks tasty. Oh we love stir fry and have it like once a week. Now if I could just get the rest of the fam on board with the shrimp part! I love salad kits. 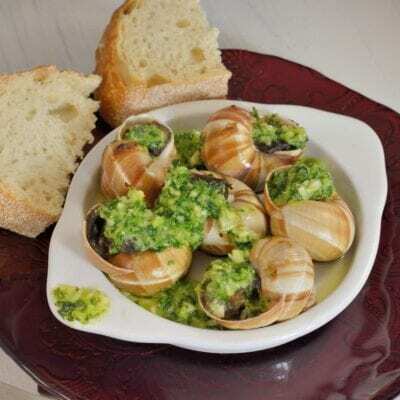 They’re a great side dish or main entrée when I am having a long day and am too burnt out too come up with dinner! Oh yum. These are the types of meals I like to eat. Light and refreshing. My husband would love this dish! I like that you can find salad packs in different cuisine. I am already a huge fan of eat smart salad packs. Eat Smart salads look and sound like a wonderful way to make a healthy meal that tastes great! 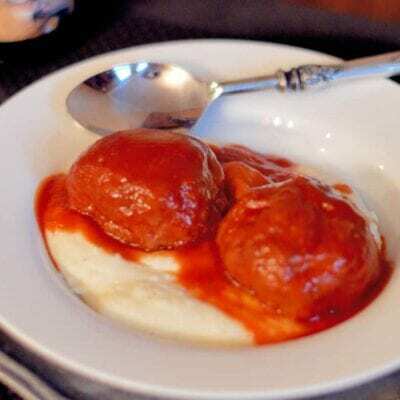 Thanks for the excellent recipe and beautiful pictures to show how it turns out. This looks great! I love anything w/ bok choy! I have to keep my eye out for these kits! Those kits sure sound like they make life a million times easier – and I like anything that makes my life easier and saves me time. The salad looks delicious! I love a good salad…I will check these out. I could go for one of these right now. Those look super delicious. I am trying to eat healthier for me and for the sake of my wedding dress haha! This looks really good. I love salad and shrimp. I like having a healthy lunch or dinner option. My family loves these salad kits and bags. They are always tasty and full of great nutrients and so convenient.